Factory that cleared pharmaceutical affairs law and acquired permission produce "medical equipment"
At present we have 7 production plant. Producing 50,000,000 pairs of socks annually. We are capable of receiving small orders to more than a million pairs of large orders. Meeting flexible demands　in quantity at our large line of production in China is possible. With meticulous high technology and reliable knowledge, many different types of high quality socks can be made as well, from design socks, fashion socks, to medical socks. We are capable of receiving small orders to more than a million pairs of large orders. Meeting flexible demands in quantity at our large line of production in China is possible. With meticulous high technology and reliable knowledge, many different types of high quality socks can be made as well, from design socks, fashion socks, to medical socks. Alway doing research on production line. Latest manufacturing trends are researched as well. Arranging and tuning various type of machinery, each having its own characteristic. We keep them at top condition to meet various orders any time. 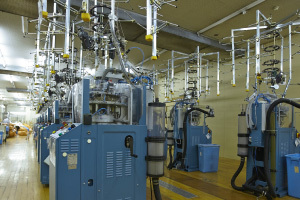 Production line that is capable of knitting different types of multiple thin yarns at various tension. Production line that is capable of making stitches that are loose but firm at same time. Socks that requires high class look. Socks that requires function. Different designs and stitches are applied, according to the characteristic of the yarn. Technique to knit thick but looks thin, or vice versa. Using yarns with ceramic particles for medical socks. 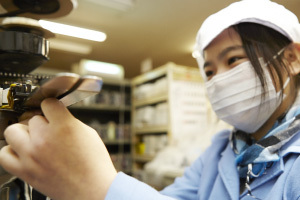 ●Factory that cleared pharmaceutical affairs law and acquired permission to produce "medical equipment". In the year 2002 we have started a joint development of medical socks with a pharmaceutical company. In 2006 our "TAKADA factory" which started the production of medical socks acquired nationally approved medical certificate for producing medical equipment. 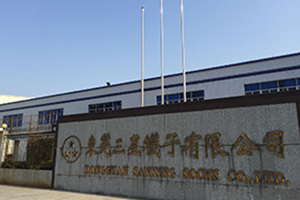 With computerized control over the latest precision knitting machines acting in unison, very strict health management, and severe quality control without exception, the production of socks that are certified as "medical equipment" became possible. In 1994, we have established a factory in Dongguan city within Guangdong province of China, allowing us to meet the demands for large amount of orders. To meet the arising extra needs, we have added a new factory in 2007, with lines of latest knitting machines from Italy. Allowing us to produce larger quantity. In regard to machinery, we make selections from all over the world . When the machine needs elaborate minute fine function we often make arrangements with Italian machine builders. The collaboration leads to implementing suited machines. 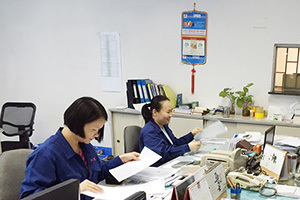 We have stationed staff and established an office in Guangdong province of China. System in which the staff can communicate with headquarters has been arranged. At any time, quick and correct correspondence, processing business matters are possible. The high efficiency in handling large quantity order is possible. through strict quality control in every process of manufacturing, which is regulated under tight human management. ●Heart felt manufacturing and inspection. The computer is indispensable in carrying out the quality control required by the pharmaceutical affairs law. However, even in very strict medical sock's inspection, the process with person's eye works and hand works are more correct and efficient. At the end step of socks production process, such as packing and inspecting, all the employee help out the process. Until the completion, we care for heart felt manufacturing in our products.